One site under current development for an OTEC system is the Bahamas. The Bahamas Electricity Corperation (BEC) signed a Memoradum of Understanding (MoU) with Ocean Thermal Energy Corporation (OTE Corporation), a Pennslyvania based renewable energy company in hopes of being the first to supply ocean-based energy for the general public (Ferris, 2012). The agreement includes the construction of two 10-megawatt commercial scale OTEC plants of original design. OTEC has agreed to pay entirely for the plant construction with BEC footing the purchase of the energy generated (Todd, 2011). The end result: cleaner, reliable and budget friendly power. However as with any innovation in development, the true capability and impact of the plant will only be known upon it’s completion. With OTEC systems re-gaining momentum, economists and scientists alike have to ask what exactly prompted plant development after about 30 years of little growth. With the improved efficiency, cost competition is shifting in OTEC’s favor. Generating electricity in island locations off traditional methods comes with a high cost tropical nations are looking to part from (Handwerk, 2012). As renewable energy begins to see the funds it has long needed for research and development, OTEC systems can be predicted to see continued improvement. Unlike solar and wind harvested power, ocean thermal energy operates 24 hours a day without any fossil fuel input required. 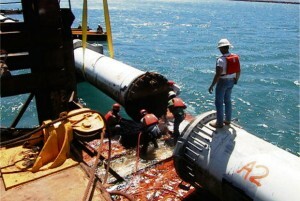 In the case of the Bahamas, OTE Corporation predicts the installed pipes will have the ability to harvest largely more cold seawater than needed for power alone (Ferris, 2012). The company believes the excess water could be used in desalination systems and specialized agriculture to produce commodities unable to prosper in the warm environment without the incoming cold water stream. Jeremy Feakins, OTE Coroporation’s CEO and Chairman, has commented that the development of the plant will be a long term project. Feakins wants to ensure that no mistakes will be made and that the plant is developed to be a “shining example” of OTEC facilities capabilities (Todd, 2011). Though no official date or price has been disclosed, it is rumored the plant is intended to be developed by 2015 (Hahn, 2012) at a predicted cost of $1.5 billion for the Bahamas Electricity Corporation’s Project along with an additional plan for Baha Mar. OTE Corporation has stated that additional projects are in line for the Virgin Islands, the Cayman Islands, Puerto Rico, and the Tanzanian island of Zanzibar. Other companies also are beginning development in tropical regions, such as Bluerise in Curacuo and the French military contractor DCNS (formerly Direction Technique des Constructions Navales) on the island of Martinique, the Reunion Island and Tahiti (Ferris, 2012). Japan, unlike the United States, has incredibly limited on-shore space, and with the sun and the wind being intermittent, around 80% of Japan’s long term energy supply remains insecure. The country has never been largely reliant on fossil fuels and with the Tohoku earthquake, tsunami and nuclear disaster, nuclear power is an unattractive option. Even with little current, small salinity gradient resources, and major storms just off the coast, is the ocean is Japan’s best option for sustainable energy for the future. Ocean thermal energy conversion (OTEC) in particular has been labeled “the only productive answer” for the country recovering and rebuilding after recent natural disasters and the falling economy that followed. 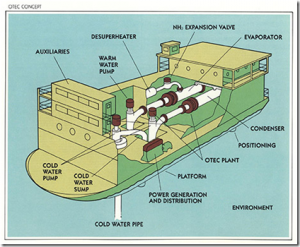 OTEC was tested in Japan thirty years ago on Nauru by the Tokyo Electric Power company. The experiment was widely successful however a hurricane eventually wiped it out. Now, Japan looks at the success seen and considers using OTEC to power a plantship. This ship would graze along the coast, providing benefits in the upbringing of fisheries. Additionally, opportunities would be seen for the development of marine biomass plantations, which would produce biofuels at sea, electricity, and freshwater. Platforms on the sea surface would harvest the energy, The water intake could be installed vertically, allowing pipes to be much shorter. Construction and operation costs in turn would be cheaper and damage to pipes less as they would float versus being cemented to the sea bottom. 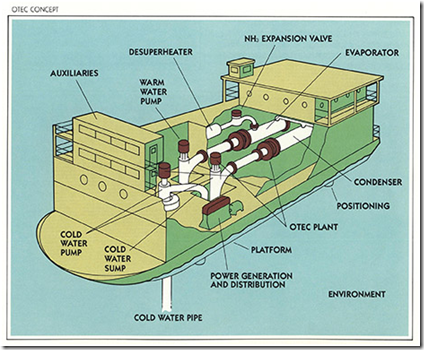 In being pumped up to the at-sea “power plants”, cold water would retain its low temperature making net power generation far higher. The platforms could also be equipped harness sun and wind resources. Construction would require zero of Japan’s limited land space. A demonstration facility test is set to be carried out in Okinawa Prefecture by three companies: IHI Plant Construction Co.,Ltd., Yokogawa Electric Corporation and Xenesys Inc. at a cost estimate of 500 million yen. The design is of 50kW nameplate capacity and should be complete by March 2013. The test claims to be the first OTEC demonstration conducted in an “actual ocean environment” with consideration to commercialization. What remains a high priority is a protection mechanism for such devices to allow them to withstand storms. Otherwise, the large capital investment the technology requires would fail to be feasible lacking long term energy generation. Compared to other power plants, the construction cost of OTEC systems is high but once established fuel cost is negligible. Ótima leitura! O artigo foi bem escrito e cobriu as partes importantes do assunto.